Hanover Raceway’s web site has been recently redesigned. Moving from a traditional static HTML web site allows site manager Gord Dougan to handle many of the day-to-day tasks internally. Although page content will be reasonably static, the racetrack generates a lot of news and is able to generate a significant following of racing fans. Commentary on race results, driver & horse profiles are just a couple of the topics of interested in knowing more. The new site design is more modern-looking, makes good use of photos and offers simpler navigation. 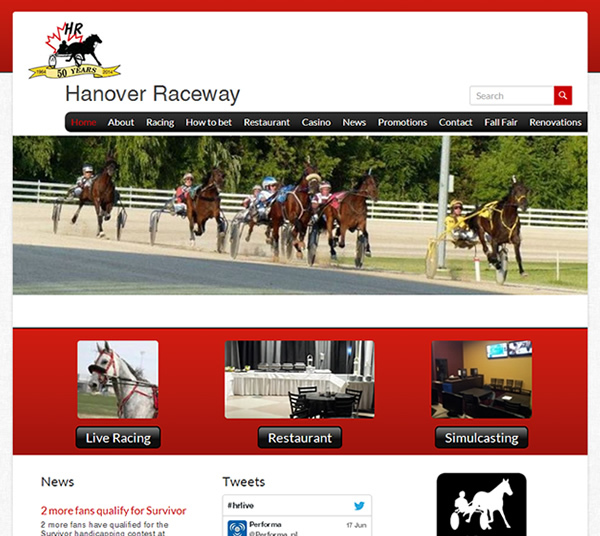 In addition to harness-racing, Hanover Raceway includes both a casino and restaurant, both of which get more visibility in the new web site.